Carotid artery surgery performed by the vascular surgeons at The Vein & Vascular Institute of Riverview leave minimal to no scars and offer quick recovery time because it can be performed using non-invasive endovascular surgical techniques, such as balloon angioplasty and stenting. With over 130,000 unexpected deaths caused by carotid artery blockage (carotid artery disease), our Riverview vascular surgeons recommend getting treatment as soon as carotid artery blockage has reached a dangerous level because carotid artery disease can become fatal. Carotid artery disease is caused by plaque build-up that is made up of cholesterol, calcium and fibrous tissue in the neck (carotid) artery. As the accumulation of plaque in the carotid artery increases with time, the blood flow to the brain becomes restricted. This restriction of blood flow to the brain is what eventually leads to a stroke. Having a stroke can unexpectedly take your life or leave you severely disabled. Depending on the extent of the blockage discovered in the carotid artery, your doctor might simply recommend lifestyle adjustments, medication, non-surgical invasive procedures or, as a last resort, carotid artery bypass surgery. If a little narrowing is discovered, but does not pose an immediate risk our Riverview vascular surgeons may recommend that the patient stick to a healthy diet, follow a formal exercise plan, and stop smoking, if they smoke. Depending on the individual and their overall health, medication may be prescribed to keep the disease under control and prevent it from progressing. If a patient has diabetes or high blood pressure and has also been diagnosed with carotid artery disease, the diabetes and high blood pressure must be brought under control, since they are contributing factors to the disease and may cause it progress more quickly. 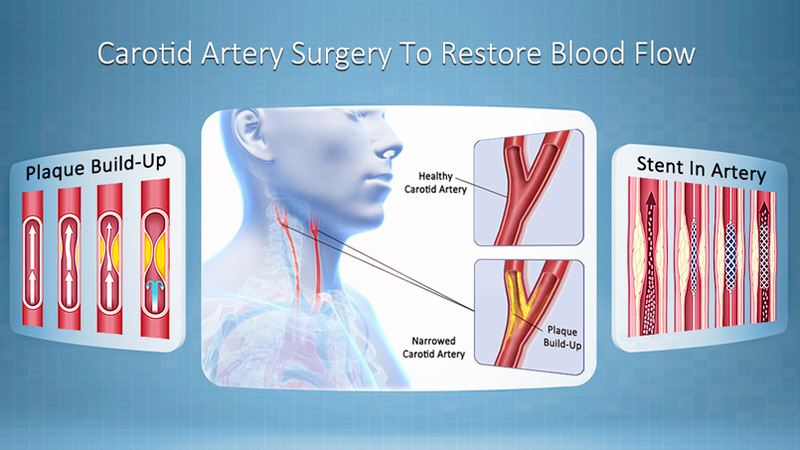 If after following all the recommendations of our vascular doctors to stop the progression of the disease, the carotid artery blockage continues to worsen, or if the blockage has reached a dangerous level, non-surgical invasive procedures such as Balloon Angioplasty, Stent Deployment or Percutaneous Endovascular Atherectomy can be performed to improve blood flow through the carotid artery. 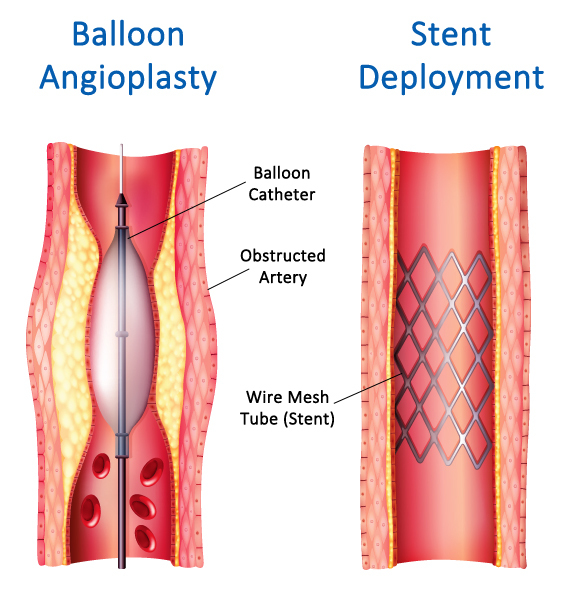 Balloon Angioplasty is a type of carotid artery blockage treatment where a balloon catheter is used to widen the narrowed or obstructed artery. During Stent Deployment (Carotid Stenting) a wire mesh tube, or stent is placed inside the narrowed artery to keep the artery open for better blood flow. If a Percutaneous Endovascular Atherectomy is performed, plaque is actually scraped away and removed from the blocked carotid artery through a small incision in the skin. The Percutaneous Endovascular Atherectomy procedure provides longer lasting results. Lastly, in more threatening cases of carotid artery disease and where non-invasive procedures are not an option, carotid artery bypass surgery may be necessary. During bypass surgery, the patient’s own veins from their body or prosthetic devices are used to bypass around the arterial blockage. The Board Certified Vascular Surgeons at The Vein and Vascular Institute of Riverview have helped thousands of patients suffering from carotid artery disease, reducing their risk of having a stroke. Our vascular surgeons are experts in carotid artery surgery and they are of the few vascular surgeons in Riverview who have hospital staff privileges at major hospitals such as St. Joseph’s Hospital. In our Nationally Accredited Vascular Laboratory, we offer state-of-the-art therapies and we are equipped with the most advanced ultrasound equipment for diagnostic and therapeutic interventions. Our mission is to always provide compassionate and individualized care to all our patients. If you live in the Riverview, Florida area and you think that you are at high risk for carotid artery disease, or if you have experienced any of its symptoms, please do not hesitate to schedule an appointment with us for a consultation. A simple carotid artery ultrasound can be performed in our office to see whether or not you have developed blockage in your carotid artery and if you are in danger of having a stroke. Give us a call today at (813) 999-3992 to schedule a carotid artery ultrasound or to schedule a consultation to find out which carotid artery surgery would be appropriate for your particular situation.